The city of Portland is situated at the confluence of the Willamette and Columbia rivers, and is known for its scenic beauty; this city is the perfect place to arrange to pick up a Portland RV Rentals to explore the State of Oregon in the USA. Oregon is a brilliant place to spend a relaxing holiday; there is a wealth of natural beauty and many kinds of outdoor activities to be enjoyed year round; one of the best ways to see several parts of the State is to explore it in your Cruise America RV rental in Oregon. Before venturing into the country side you need to see the many attractions in Portland city. There are several RV Campsites just outside the town (just 7 miles from downtown Portland). Here you can park your Cruise America Portland Motorhome rental, while you enjoy some the galleries, museums and great restaurants in the city. Our Portland RV rentals depot has 3 categories of RV rental vehicle for you to choose from. Couples (plus one young child) can choose the Cruise America C19 Compact Motorhome, which still offers all you need for a comfortable and budget-friendly holiday experience, with the additional benefit of being slightly narrower, and thus easier to drive and park. It comes equipped with a shower and toilet, good kitchenette and a generator (although most RV holiday parks provide electrical hook-up). Our Cruise America C25 Standard Motorhome rental has all the above features and comfortable sleeping facilities for 5 adults. The final choice of Portland RV rentals is for the larger family; the Cruise America C30 Motorhome rental from Portland, Oregon can accommodate 6 adults and a child. Oregon has some really excellent RV holiday parks with exceptional facilities; Jantzen Beach RV park, for instance, offers all you would expect; from good ablutions and communal kitchen, to free wi-fi and 3 heated outdoor pools. 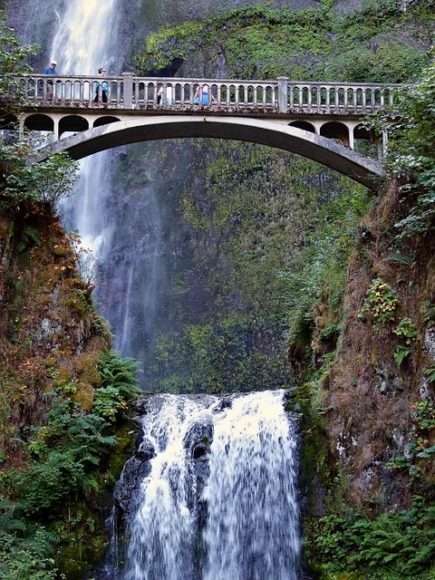 Oregon has many beautiful destinations to take your campervan hire or motorhome rental! Take a drive to the Columbia River Gorge for excellent scenery, wildlife viewing and pure relaxation in the Great Outdoors. When you need some retail therapy; St Helens and Veronia have lots of quaint and quirky shops to keep you happy. Or try Mount Hood territory for great summer sporting facilities including kayaking and rafting, hiking and fishing. This region has many Farmer’s markets, and wine, arts and harvest festivals year round. The Willamette Valley is a must for wine lovers – this is the heart of the Oregon Winelands and home to over 200 wineries for you to visit.